Food Empowerment Project seeks to create a more just and sustainable world by recognizing the power of one’s food choices. We encourage healthy food choices that reflect a more compassionate society by spotlighting the abuse of animals on farms, the depletion of natural resources, unfair working conditions for produce workers, and the unavailability of healthy foods in low-income areas. By making informed choices, we can prevent injustices against animals, people, and the environment. We also work to discourage negligent corporations from pushing unhealthy foods into low-income areas and empower people to make healthier choices by growing their own fruits and vegetables. In all of our work, Food Empowerment Project seeks specifically to empower those with the fewest resources. Food Empowerment Project is a vegan food justice organization and a registered non-profit 501(c)(3) and was founded in 2007 by lauren Ornelas. Learn more about the organization’s leadership team. Food Empowerment Project is a vegan organization founded by a woman of color. Our values include a stance against racism, sexism, homophobia, transphobia, ableism, ageism, and body shaming. That is not to say we have never made mistakes or we never will, but we do our best to learn and listen to those impacted to make any necessary changes. These values also include supporting a variety of causes, such as boycotts called by farm workers and other impacted community members, as well as supporting and amplifying the voices of those in communities of color, women impacted by sexism or harassment and bullying in the animal movement, and those who speak out against violence to human or non-human animals. FOOD EMPOWERMENT PROJECT accepts donations. Donate Now. 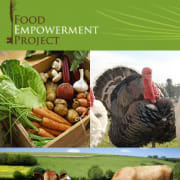 Would you recommend FOOD EMPOWERMENT PROJECT?